You will get quite a lot in one packet. Some are simply the kraft card color but others can have several different colors in one pack ! They are usually sold in the stationery isle and once the holiday is over the rest of them just sit there looking at you ... defying you to use them!! Well here is a really good way to put them to use and you can dress them up in many different ways. 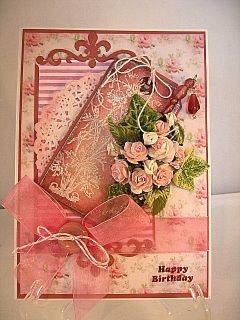 On this card I have added a stamped a floral image on to the tag and then heat embossed it with a fine detail white powder. The Mulberry Flowers and the Ivy have then been added to the tag with Pinflair Glue Gel and then everything is added to the card with a paper doily underneath. There is a tutorial here on Decorating Hatpins. 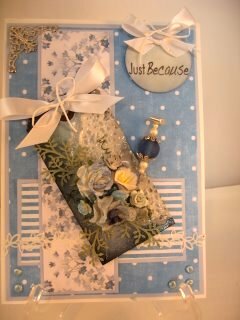 I have kept the tutorial easy to follow especially for those new to cardmaking ... but once your confidence grows you can experiment with the tags and see what you can produce for your self. There are many techniques explained on the website so that you won't be stuck and they are all are easy to do. The whole tag has been heat embossed in clear powder for this card and it gives a lovely shiny surface on which to add the corsage. Paper flowers and punched leaves have been added and the punch is the Ash Branch from Leonie Em. Tuck these delicate leaves into your flowers for a very pretty effect. The card has been matted and layered to add interest and of course the Hatpin is also included in this card too. You can use anything that you have in your "stash" to give you the result you want and the card once finished will be a pleasure to give to anyone for any occasion. 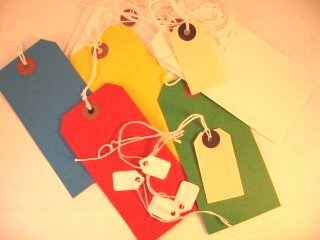 And you will have the satisfaction of using tags on cards instead of allowing them to sit there doing nothing.